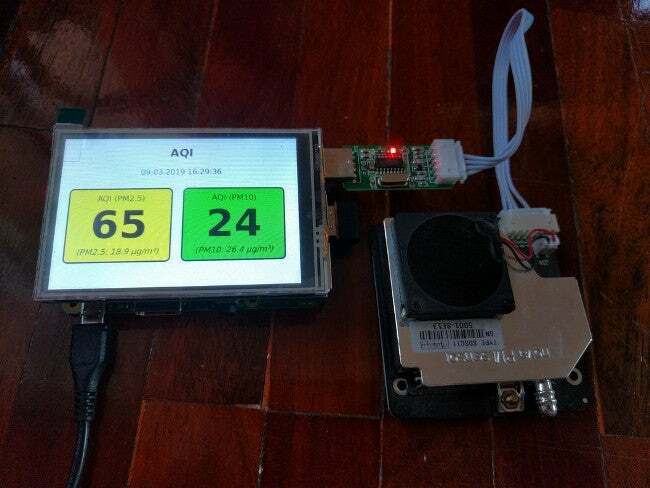 Monitor your air quality with a Raspberry Pi, a cheap sensor, and an inexpensive display. About a year ago, I wrote about measuring air quality using a Raspberry Pi and a cheap sensor. We've been using this project in our school and privately for a few years now. However, it has one disadvantage: It is not portable because it depends on a WLAN network or a wired network connection to work. You can't even access the sensor's measurements if the Raspberry Pi and the smartphone or computer are not on the same network. To overcome this limitation, we added a small screen to the Raspberry Pi so we can read the values directly from the device. Here's how we set up and configured a screen for our mobile fine particulate matter sensor. There is a wide range of Raspberry Pi displays available from Amazon, AliExpress, and other sources. They range from ePaper screens to LCDs with touch function. We chose an inexpensive 3.5″ LCD with touch and a resolution of 320×480 pixels that can be plugged directly into the Raspberry Pi's GPIO pins. It's also nice that a 3.5″ display is about the same size as a Raspberry Pi. This command installs the appropriate drivers and restarts the Raspberry Pi. Here is what we want our project to do: If the Raspberry Pi boots up, we want to display a small website with our air quality measurements. In the menu, select: 3 Boot Options → B1 Desktop / CLI → B4 Desktop Autologin. I've made a few small changes to the code in the last year. So, if you set up the air quality project before, make sure to re-download the script and files for the AQI website using the instructions in the original article. By adding the touch screen, you now have a mobile particulate matter sensor! We use it at our school to check the quality of the air in the classrooms or to do comparative measurements. With this setup, you are no longer dependent on a network connection or WLAN. You can use the small measuring station everywhere—you can even use it with a power bank to be independent of the power grid. This article originally appeared on Open School Solutions and is republished with permission. While the addition of the screen is nice, you haven't really solved the issue of having to be on the same network to view the results. If that really were a major concern, you've actually made it worse in that you now have to have physical access to the machine to read the results. If you really wanted to have your air quality readings remotely viewable (and as a school, why would you do this? ), just make an entry on the NAT table and be done with it. @random guy: The goal was to have a mobile / portable sensor. With this setup we don't need any network connection at all (after setup). In school we put everything in a nicer casing and use it in the classroom to measure the air quality. We do have other stationary sensors we use and have a website (separate) website running that displays the values on different screens on the campus.